Epsom salt baths have been promoted as a potential weight-loss solution since the 1900s, but this doesn't mean they actually work. No scientific evidence is on record to recommend them for this purpose, according to an article on the Library of Congress website. Likewise, taking these salts internally isn't likely to lead to lasting weight loss and could actually have some adverse effects on your health. Check with a doctor before using Epsom salts internally, as doing so isn't safe for everyone. Celebrities and athletes trying to lose weight sometimes mention using Epsom salt baths to slim down, but these baths aren't likely to lead to any lasting weight loss. Most likely, any small amount of weight you lose through the use of the baths is from the hot water of the bath, which can cause sweating and water weight loss. This water weight is most likely going to come right back once you're no longer dehydrated. Spending too much time in hot baths can also cause lightheadedness or fainting, and repeatedly going through the process could have more lasting adverse effects on your health, including weakened bones and disruptions to the menstrual cycle. Epsom salts, or magnesium sulfate, can be used internally as a laxative. The salts bind with water from your body to make stool softer and easier to pass, potentially helping to treat constipation. As with Epsom salt baths, any weight loss is most likely water weight and not the fat loss you're trying to achieve to help you slim down. Internal use of Epsom salts can cause side effects, including nausea, diarrhea and vomiting. They may also interact with certain medications and be unsafe for people with some health conditions, including kidney disease and diabetes. Using laxatives for weight loss can cause potentially irreversible damage to your body, such as a slower metabolism, nutrient deficiencies, laxative dependence, dehydration and electrolyte imbalances. Adults shouldn't consume more than 350 milligrams of supplemental magnesium per day. Each teaspoon of Epsom salts contains 495 milligrams of magnesium, and the typical dosage for laxative purposes is 2 to 4 teaspoons mixed with water one to two times per day. As a result, it isn't hard to ingest higher-than-recommended amounts of magnesium. Symptoms of magnesium toxicity include confusion, vomiting, nausea, irregular heartbeat, low blood pressure, heart attack, coma and, in extreme cases, death. Instead of using an unproven method to try to lose weight quickly, eat 500 to 1,000 calories fewer each day to lose weight at a safe rate, about 1 to 2 pounds per week. Limiting fatty, salty and sugary foods and beverages, including highly processed foods, and focusing on eating fruits, vegetables, whole grains and lean protein foods can help you do this while getting the essential nutrients you need each day. For even better results, add exercise to your daily routine. Aim for 30 to 60 minutes per day of cardio and two sessions of strength training each week. Library of Congress: Battling With the Scale: A Look Back at Weight Loss Trends in the U.S.
Daily Mail: Granny Was Right! 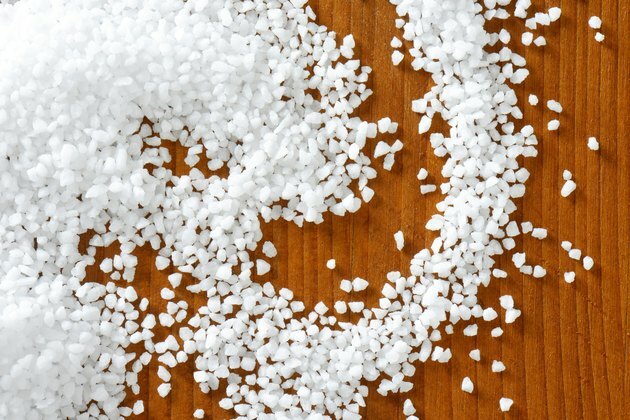 Liberty Voice: Epsom Salt Benefits: Fact or Myth? Go Ask Alice! : Laxative Abuse -- Any Side Effects?